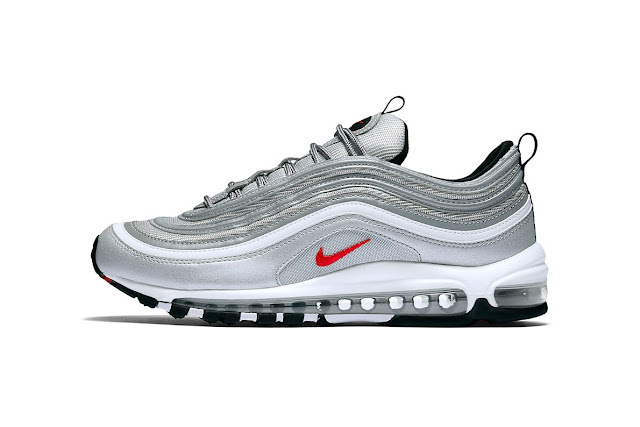 After restocking earlier in the year, the “Silver Bullet” Nike Air Max 97 is set to return this month. Specifically, the ever-popular colorway is returning on Black Friday. One of the already-popular sneaker’s most desirable colorways, the “Silver Bullet” variant of Nike‘s 20-year-old running shoe is recognized by its bold metallic upper. A red Swoosh appears on the side and tongue of the shoe, amidst tonal silvery shades, hits of black and matching laces. The sneaker also offers dual pull tabs on the tongue and heel and a bi-color, monotone sole with visible Air. Expect the $160 USD sneaker to arrive at Nike retailers on November 24. In related news, the in-demand UNDEFEATED x Nike Air Max 97 released this past weekend.